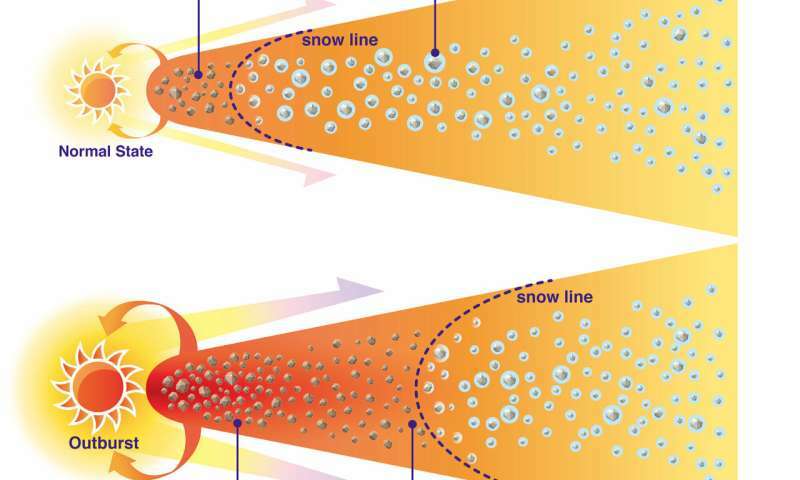 Various molecules are frozen in ice around micrometer-sized dust particles in protoplanetary disks. V883 Ori's sudden flare-up is heating the disk and sublimating the ice, which releases the molecules into gas. The region in a disk where the temperature reaches the sublimation temperature of the molecules is called the "snow line." The radii of snow lines are about a few astronomical units (au) around normal young stars, however, they are enlarged almost 10 times around bursting stars. "It is difficult to image a disk on the scale of a few au with current telescopes," said Lee. 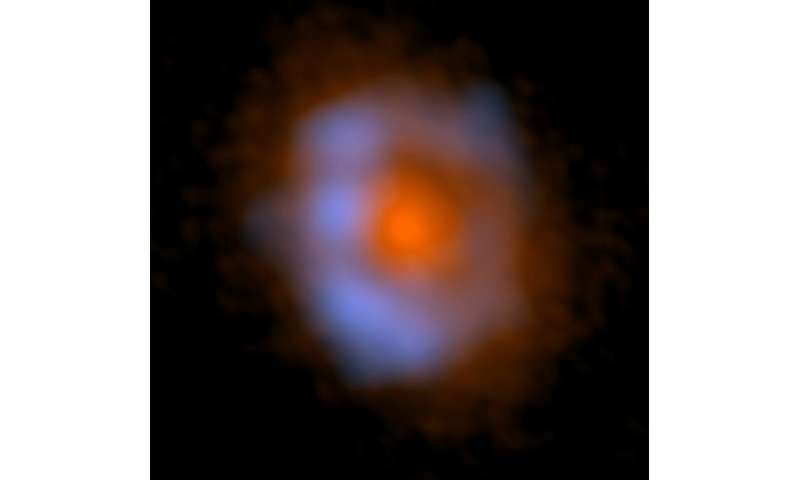 "However, around an outburst star, ice melts in a wider area of the disk and it is easier to see the distribution of molecules. We are interested in the distribution of complex organic molecules as the building blocks of life." Ice, including frozen organic molecules, could be closely related to the origin of life on planets. In our solar system, comets are the focus of attention because of their rich icy compounds. For example, the European Space Agency's legendary comet explorer Rosetta found rich organic chemistry around the comet Churyumov-Gerasimenko. Comets are thought to have been formed in the outer colder region of the proto-solar system, where the molecules were contained in ice. 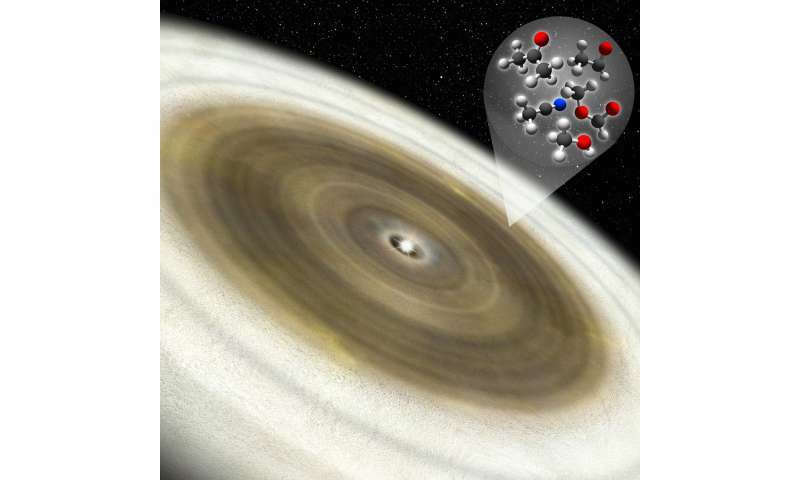 Probing the chemical composition of ice in protoplanetary disks is directly related to probing the origin of organic molecules in comets, and the origin of the building blocks of life. Thanks to ALMA's sharp vision and the enlarged snow line due to the flare-up of the star, the astronomers obtained the spatial distribution of methanol and acetaldehyde. The distribution of these molecules has a ring-like structure with a radius of 60 au, which is twice the size of Neptune's orbit. The researchers assume that inside of this ring the molecules are invisible because they are obscured by thick dusty material, and are invisible outside of this radius because they are frozen in ice. "Since rocky and icy planets are made from solid material, the chemical composition of solids in disks is of special importance. An outburst is a unique chance to investigate fresh sublimates, and thus the composition of solids," says Yuri Aikawa at the University of Tokyo, a member of the research team. These observation results are published as Lee et al. "The ice composition in the disk around V883 Ori revealed by its stellar outburst" in Nature Astronomy on February 4, 2019. I guess there is a lot of water everywhere. Good news for what we know about evolution.